You remember my "Let's Picnic" Invitation Tags right? Well, there was a small mention of them in the latest issue of Frankie magazine!! They are a part of their 'pretty things for a picnic' collage on page 67. I loooove Frankie so I"m absolutely thrilled!! If you haven't already, you can download the tags for free right here. I'm excited to announce that I've been interviewed in the latest issue of Dujour Magazine! 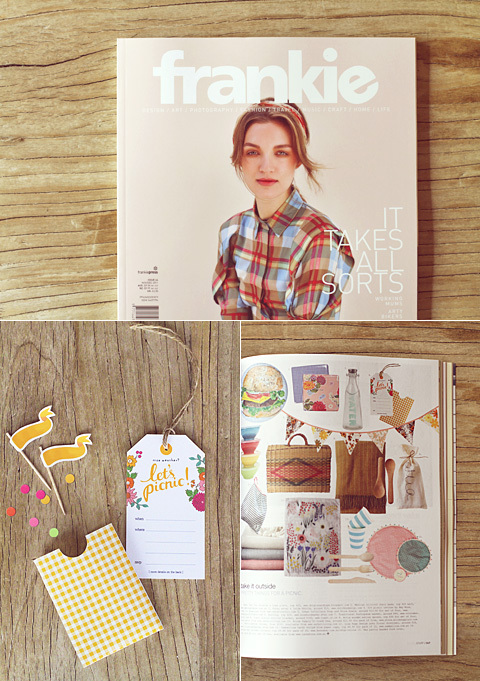 You can see a sneak preview of the very cute 'holiday handmade issue' here. Subscribe for the full copy. I'm so thrilled to announce that one of my favourite interior design magazines, Inside Out, has mentioned Eat Drink Chic in their Jan/Feb 2010 issue! It's listed on page 36 under "Stationery blogs we're loving" alongside four other gorgeous blogs. The Cool Hunter- a site that I've been a fan of for years- has done a little write up about me and my blog! Check it out! Also, I know it's been awhile since I've provided any new DIY Projects and Freebies- Apologies! Life has been a little hectic- add to this a nasty cold that I can't seem to shake. Just letting you know that I am currently working on some new stuff that I will hopefully be able to share with you soon! Thanks for your patience. I woke up this Friday morning to a lovely surprise! A big thank-you to the ever-inspiring iDiY for the link and the kind words today. The recognition was a tremendous inspiration boost and I'll be making sure to keep up the DIY-ing. Thanks also to Craft Gossip and Little Ant Design for their kind linkage! Oh, and I've been dying to use this idea for awhile and it's the perfect excuse to- Thankyou and Birthday Gift tags in a style similar to French vintage flash cards. Just a simple freebie for this sunny Friday. FREE DOWNLOAD: Flash Card Gift Tags. NOTE: Print onto textured white card stock.